Watson­-Watt was born on April 13, 1892, in Brechin, Scotland. He won a scholarship to attend University College, Dundee, where he developed an interest in the recently established field of wireless telegraphy. Earning a degree in electrical engineering in 1912, he taught briefly at University College. In 1914, at the beginning of World War I, he began working for the British government’s Meteorological Office, researching methods of tracking storms with radio waves. In 1919 Watson­-Watt received a bachelor’s degree in physics from the University of London. In 1927 the government facility at which he was posted became the Radio Research Station, and he was appointed director. In 1935 a government official asked Watson­-Watt whether radio waves could be used to destroy enemy aircraft. 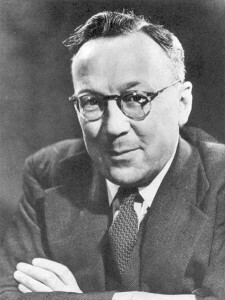 He and his assistant A. E. Wilkins explained that, while actual destruction was not possible, radio waves would be capable of detecting the location of aircraft A program was initiated for the development of this idea. Watson­ Watt soon engineered a device capable of detecting aircraft at a range of 130 kilometers. The term RADAR stands for Radio Detection And Ranging; it works by sending pulses of radio waves in the direct, on of a target. The interval of time before the waves are detected at the source after reflecting off the target indicates the targets distance, and the direction from which the reflected waves return indicates the targets position. Watson­-Watt opened a private consulting firm specializing in engineering in 1946, but little else is known of the last decades of his life. He died on December 5, 1973, in Inverness, Scotland. Watson­-Watt’s radar device became an integral part of equipment used in military operations, navigational aids, commercial air traffic, weather detection, and terrestrial and extraterrestrial mapping. Radar systems were in place along Britain’s coast by 1939, at the onset of World War II, and soon installed in fighter aircraft for the detection of targets at night and in cloudy conditions. Some observers claimed that radar was chiefly responsible for Britain’s successful defense against the German air attack in the Battle of Britain in 1940. With numerous refinements and improvements, radar continues to be used in military aircraft for locating targets, measuring altitude, and detecting missiles and enemy craft. In 1951 the first radar systems tailored for meteorology began operation. Early radar was especially effective in tropical regions and at sea and quickly became the primary instrument for tracking tropical cyclones. It was found to be invaluable as a tool for warning of approaching severe weather. In 1969 the space probes Mariner 6 and Mariner 7 used radar to reveal mountainous structures covering the surfaces of Mars and Venus. Modern airplanes typically have radar antennae in the nose to receive reflected signals from clouds ahead. Aircraft and ships use radar not just to monitor weather conditions, but also to regulate altitude, locate airstrips and harbor mouths, and map Earth’s land contours and sea floors.